We are full-season vendors at the Wakefield Market. In 2016 you will find us there every Saturday from May 21st until October 16th, from 9am until 1pm. Our popular village market features produce from local farms, food prepared on site, fantastic local musicians, and many creative craftspeople from the region. At our stand, you will find a wide selection of certified organic vegetables according to the season. In May and the first weeks of June we offer vegetable and herb plants in addition to greens and other early crops. 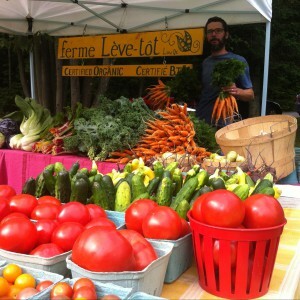 During the summer and fall our table is piled high with fresh organic veggies.